President-elect Donald Trump has chosen Iowa Gov. 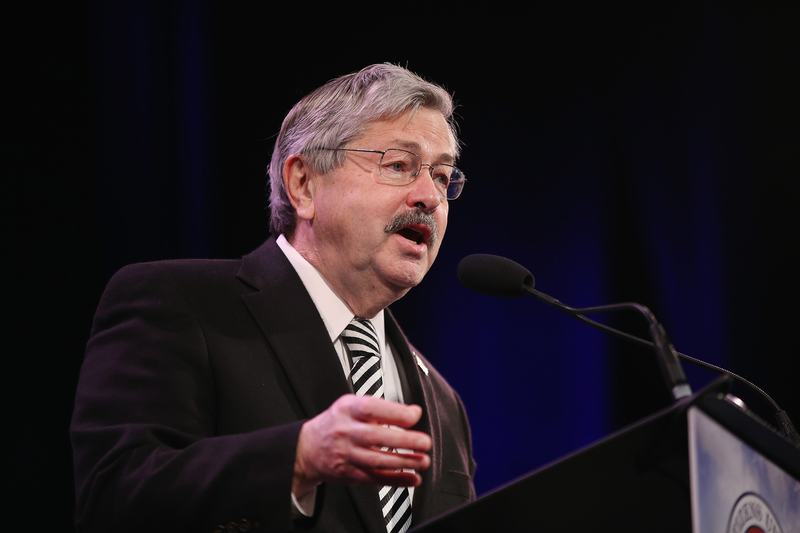 Terry Branstad for the key post of U.S. ambassador to China and Branstad has accepted, the transition team announced Wednesday. “Governor Branstad’s decades of experience in public service and long-time relationship with President Xi Jinping and other Chinese leaders make him the ideal choice to serve as America’s Ambassador to China,” Mr. Trump said in a statement Wednesday. He pointed to Branstad’s work developing Iowa’s “close trade ties with China” as experience that would serve the governor well in his new position. Branstad said Wednesday that he was “honored and humbled” to accept the president-elect’s offer. Word of the selection was first reported by Bloomberg, which says Branstad is a longtime friend of Chinese President Xi Jinping. Fox News also had the story. Branstad, a Republican, was seen in Trump Tower in New York Tuesday afternoon. Trump has a “thank you tour” rally scheduled in Des Moines, Iowa on Thursday. If confirmed by the Senate, Branstad would assume the post at a time of heightened U.S.-China tensions in the wake of Trump speaking on the phone with the president of Taiwan Friday. Taiwan is self-ruled, but China claims the island nation as one of its provinces. The call was a major break with U.S. diplomatic policy: No U.S. president-elect had spoken with a Taiwanese head of state since diplomatic ties were severed in 1979 - until Friday. There are just over 4,000 political appointments to be made by the incoming Trump administration. About 1,200 of them will require Senate confirmation -- the cabinet secretaries and their deputies, as well as those appointees who will head independent agencies, like the CIA and EPA, for instance. These nominees will go through a vetting process and Senate hearing.